Climberism Magazine is northeast climbing. We live for epic Adirondack climbs surrounded by fall foliage, dinner plate ice in sub-zero temps, and the humidity that has the rocks slicker than Vermont butter on your maple pancakes. We are the clam chowder in your thermos, the microbrew on top of Mt. Washington, and the muddy crash pad when spring season breaks. 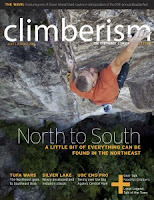 We’re not just any climbing, we’re northeast climbing. It’s who we are, it’s what we do. Subscribe and help spread the word, it's FREE! When you subscribe you will receive a referral code. If you refer 5 people you get a free Climberism t-shirt. Post it on Facebook, Twitter or e-mail it to friends. PLEASE NOTE - The magazine is definitely available to all, but I could not find any information on where they were willing to send the free t-shirt. I have emailed them for more info and will update when they respond. They also have a mail-in for a few free stickers too!! Want a few free stickers?